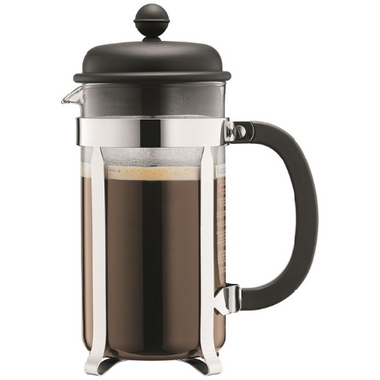 The Bodum Caffettiera French Press is an elegant and classic coffee maker. The BODUM® French press system is a pure and simple ­ way to make coffee. The materials of the French press (glass and stainless steel) are completely taste-free so nothing comes between your ground coffee beans and the hot water. The French press generates no waste at all: no metal or plastic capsules, no paper, no nothing. You only boil as much water as you need ­ and there you go! Been looking for a single-cup tea steeper made of glass. Saw this at a restaurant and found it on Well.ca. Very very happy with the purchase. Love it! Perfect for a single cup! The quality of the product is great, I even bought a bigger one for when we have guest. I love this lil French press, it makes the perfect size of coffee. It removes from the silver base making it very easy to clean, and not to mention it looks really cute on my counter. LOVE IT. I am very pleased with this French Press. It makes the perfect cup of coffee and there have been no issues with the press jamming, etc... I will never go back to using my one cup maker. I'm a French Press convert!